Time to pack up the beach chairs, get sweaters out of storage, and go back-to-school shopping. It’s also time to say goodbye to fresh, homegrown fruits and vegetables. But, in between the first frost and the last tomato, a harvest bounty of zucchini still thrives in neighborhood gardens. The fruits of this hardy, prolific vine have the tendency to ripen all at once, leaving us with the quandary of what to do with this over-abundance. A quick look online yields a multitude of savory summer squash options – cut in rounds and served over pasta; sliced ribbon-thin and quickly sautéed with yellow squash, carrots, and lemon zest; or carved into little boats and stuffed with seasoned breadcrumbs and mozzarella cheese. 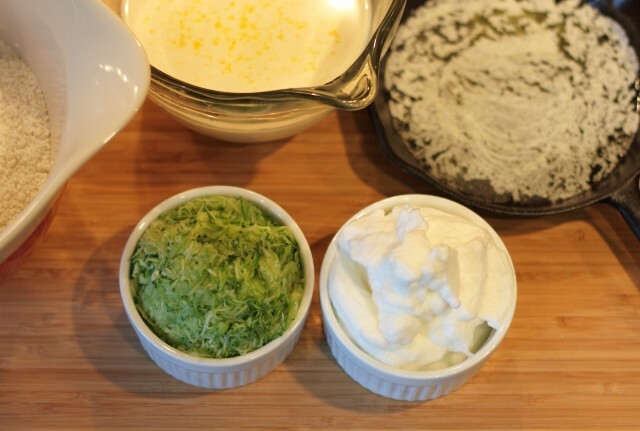 There are also many, many sweet zucchini bread and muffin recipes out there. I’m sure you all have your favorites. But what about pancakes? It might seem like an odd notion at first, but you may change your mind after digging into your first feathery light, green-specked flapjack. 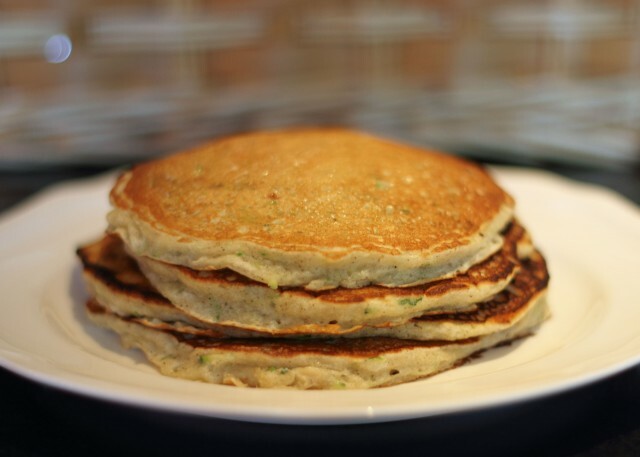 Reminiscent of zucchini bread, these pancakes have an appealing, sweet hardiness – the tender squash providing both depth and moistness. I like to shred the zucchini finely enough to cook quickly, but large enough to retain texture and color. If you shred and freeze zucchini in small batches, you can enjoy harvest breakfasts in bed all year long. Combine flour, sugar, baking powder, cinnamon and salt in large bowl. In separate bowl, stir together milk, egg yolks and vanilla. Gradually add milk mixture to dry ingredients. Fold in zucchini. Slowly add melted butter to batter. Beat egg whites until stiff peaks form and fold into batter. 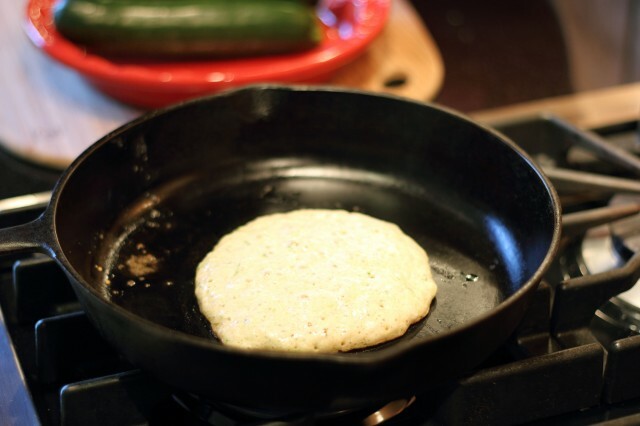 Place pan or griddle on burner over medium to medium high heat. Melt a small amount of butter in the pan for the first pancake. Ladle batter by ½ cupfuls into pan and cook until small bubbles appear throughout pancake. Flip once with spatula and continue cooking until golden brown, one to two minutes, adding more butter and adjusting heat as necessary. Keep warm while making the remainder of pancakes. Serve hot with real maple syrup. When I was a girl, I never wanted to be a princess. I wanted to be QUEEN. With red hair, pale skin, and the middle name Elizabeth, I was sure I was a royal descendant. The meager contents of my current bank account not withstanding, I still believe in decorating on a large scale. Your home and your bedroom in particular, is a reflection of who you are as a person. At home, you have the total freedom to surround yourself with furniture and objects that inspire you and make you feel good. Why play small? Go for it! Good furniture is an essential investment that will pay off for years to come. You don’t have to look far for this kind of luxury. The Charles P. Rogers website can provide you with many stunning options. I still want to be queen and this week I’d like to highlight some beautiful beds that could make you feel like royalty as well. First, the new Tansy platform bed in white leather. Gorgeous! A perfect place to wake in the morning prepared to meet your royal subjects. Nothing says drama and opulence like a canopy bed. For real. If we’re being honest, a lot of us dreamed of having a bed like this when were kids. You’re a grown up now, so it’s time to make those childhood dreams a reality. 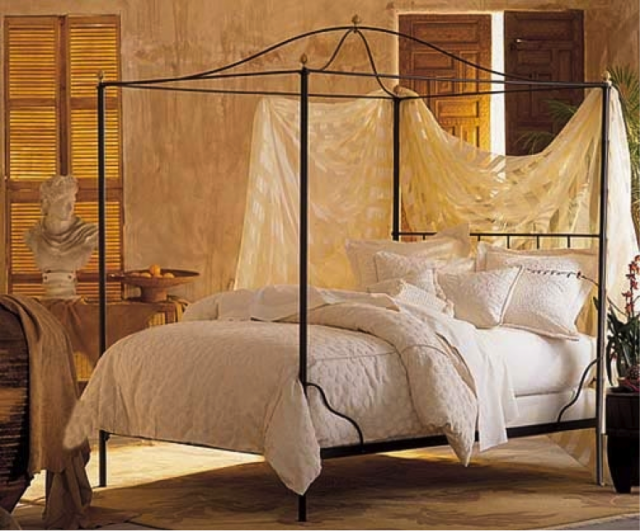 This one is the Cairo Canopy Bed with Bell Top. I like it with the finial option. If you’re going to do it, you might as well go all the way, right? Finally, we have the Marseille Bed in the black and gold finish or antique white. It’s the perfect way to display your coat of arms with pride. 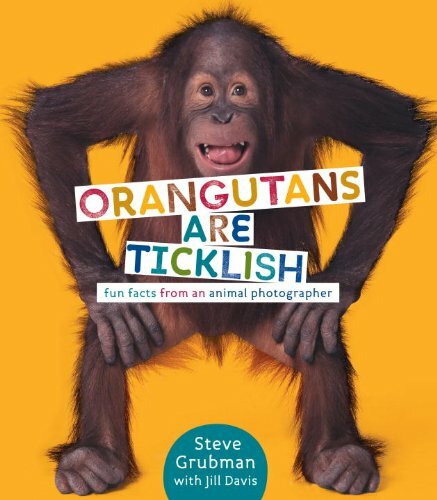 Orangutans are Ticklish : fun facts from an animal photographer by Steve Grubman with Jill Davis. Fast fact: Orangutans are ticklish. This is important survival stuff and I recommend you remember this. Also, if you see a hippopotamus yawn, he’s not sleepy so don’t go cuddle up with him. He’s liable to bite you in half! These are a few of the tidbits of information provided in this big, colorful book compiled by veteran animal photographer Steve Grubman. Each page features an awesome giant photo of an animal accompanied by factoids that will amaze and inform parent and child alike. You will finally know decisively whether that’s an alligator or a crocodile you are running from. And that ant problem in your backyard will be solved in a day by a hungry aardvark, who will eat 50,000 of those lemony critters in a day! The pictures are, of course, great and the information is brief but very interesting. My only complaint: No one seems to have a conclusive answer as to whether zebras are white with black stripes or vice versa. I’ve heard compelling arguments on both sides of this very serious issue and this book only adds more fuel to the fire. As the first leaves start to change and the apples begin to ripen on the trees, I return to my favorite autumnal events. One of such is all things spooooooky! 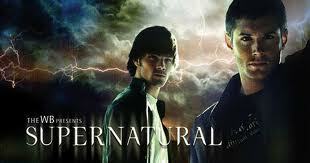 My most recent spooky favorite is the TV series “Supernatural”. Though, to be honest, I watched this all through the summer too! For those of you who enjoyed the X-Files episodes that weren’t laden with government/alien conspiracies (there were at least a couple outside of that theme!) and watched for the monsters and beasts, Supernatural is a good surrogate. The theme is simple: brothers Dean and Sam Winchester are the sons of a demon hunter. Although Dean always hunted with Dad, Sam is reluctantly drawn in when their father goes missing. Anyways, that’s how it begins. You know how these multi-season shows go: one premise leads to another until the whole underpinning story is more or less unrecognizable from the original plot line. Nevertheless, it stays excellent. And what for me separates good from really good shows is keeping it from taking itself too seriously. Supernatural is always peppered with a good dose of humor, and actually funny humor at that. And cheeseburgers. Seriously, don’t watch this if you are on a strict diet. Dean eats terribly; there paper-wrapped burgers being shoved down his maw every episode. And boy do they look good! 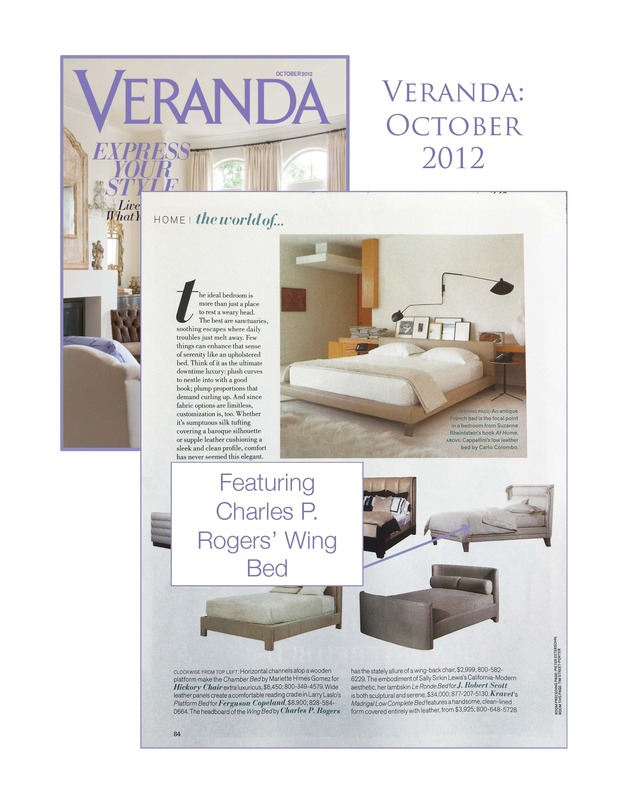 This October, Veranda Magazine is featuring a Charles P Rogers Ultra White Wing Bed in its upcoming spread on upholstered beds. This shouldn’t come as too much of a surprise considering our Wing Bed has also appeared in earlier editions of Architectural Digest and Country Living Magazine. They just can’t get enough of our beds! Classic wing back chairs, characterized by subtle curves, inspire the Charles Rogers Wing Bed. 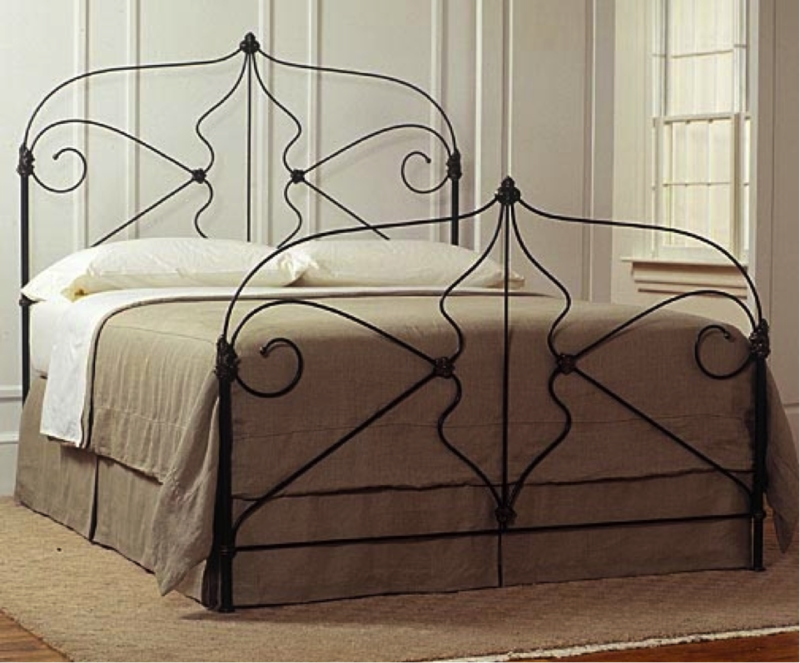 It features individually applied nail heads that trace the contours of the bed, and add a hand-finished quality. The Charles P Rogers Wing Bed comes in two colors: Ultra White or Chestnut Brown to match any bedroom design. 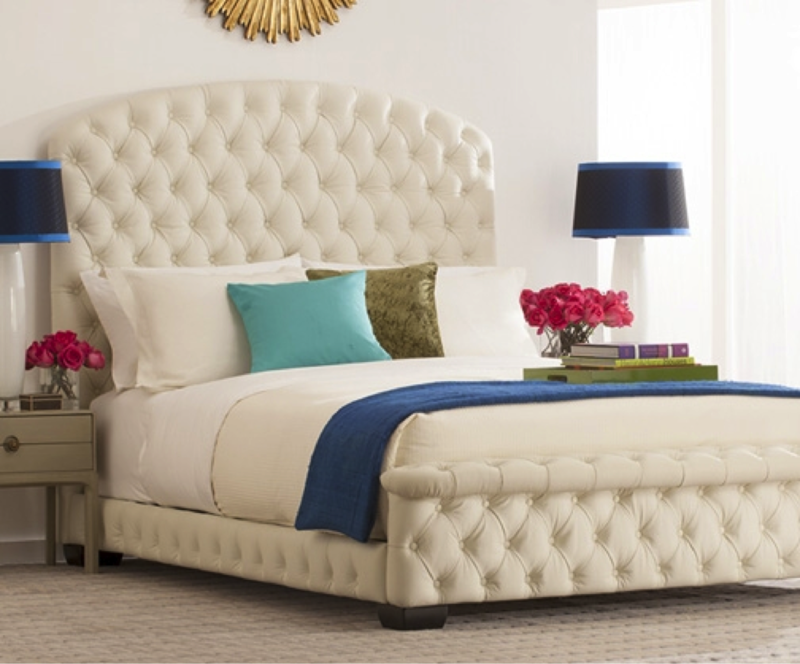 If you haven’t considered an upholstered bed before, you should. Upholstered beds fit nicely with almost any décor, and make the perfect focal point for your bedroom; a true statement piece. Upholstered beds also come with the added bonus that they can be reupholstered, which allows you to change the look and feel of your bedroom without having the replace the entire bed. However, if you’ve taken the plunge to buy a high quality upholstered bed, chances are you’ll want to leave it just the way it came. The Charles P Rogers Wing Bed is one of those beds you probably won’t want to change: they come upholstered in top grain leather, which will be hard to improve upon. Have you spotted any of our beds featured in magazines? We’d love to hear from you! Let us know in the comments below.